Grado is a historic seaside town located on a lagoon island along Italy's north-east Adriatic coast, in the Friuli-Venezia Giulia region. The town, which has a population of 9,000, is in the Province of Gorizia and is very near the head of the Adriatic Sea. It is frequently described as a northern relative to Venice; at one time it was the more important of the two towns. Like Venice, Grado was populated as the inhabitants of mainland Roman settlements fled into the lagoons to escape successive invasions. After the sixth-century fall of the Roman city of Aquileia, an important early centre of Christianity, Grado became the seat of the Patriarch or Archbishop who was reponsible for the Adriatic lagoon islands and for Istria. After various fallings-out, including an occasion when the Venetians came here and threw the Patriarch off his palace tower, Grado came under the sway of Venice and the Patriarchs moved to Venice in eleventh century, with the Patriarchate being officially moved four centuries later. Nowadays Grado is a working fishing port with a lovely historic town centre. It is also, and predominantly, a major tourist resort with miles of highly-equipped sandy beaches. For years this area belonged to the Austro-Hungarian empire, and during that time Grado was developed as a spa resort. The town is still very popular with Austrian visitors. Outside Italy and Austria, Grado is not much known, despite being an attractive historic destination with good transport links. The town is very close to Trieste Airport, and in easy reach of Trieste and Venice. It makes a nice overnight stop on a tour of this part of Italy, a base for visiting the extensive ruins at Aquileia, 6 miles away, or a good holiday destination for a trip which combines sun, sand, sightseeing and archaeology. Although the little historic centre is pretty, Grado's expansion as a beach resort has obviously had a huge impact on the island's attractiveness. There are large areas of hotels and apartment blocks built in typical ugly modern Italian style, although central areas have had smarter make-overs. Grado is really a compromise between charm and practicality, and all things considered it doesn't really do too badly. Its multiple facets also make it a good compromise as a tourist destination: if your family holiday has to satisfy varied tastes, Grado works well. The approach to Grado is very dramatic. A long causeway crosses the lagoon from the mainland - similar to arriving in Venice, but with a much emptier landscape. The lagoon is dotted with small islands including the church-island of Barbana, whose white tower shimmers in the otherwise natural waterscape. 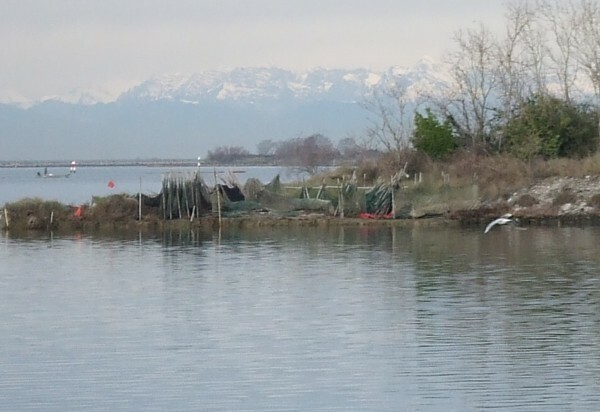 The lagoon's backdrop is of flat mainland and the mountains beyond, framed with snow in winter. Ahead lies Grado, a long thin island dividing the lagoon from the Adriatic sea. The historic part of town, with its picturesque harbour and alleys, is on the right as you approach; modern developments march off in the other direction. At first it can be quite confusing getting your bearings, so it would be helpful to pick up a map from your hotel or the tourist information office (on Viale Dante, set back from the main beach-front promenade). Several wide channels of water divide the streets of Grado, forming sheltered harbours and separating off the nice little residential island called the Isola della Schiusa. The historic part of town bulges to the south, between the fishing port, which opens into the lagoon, and the sea. 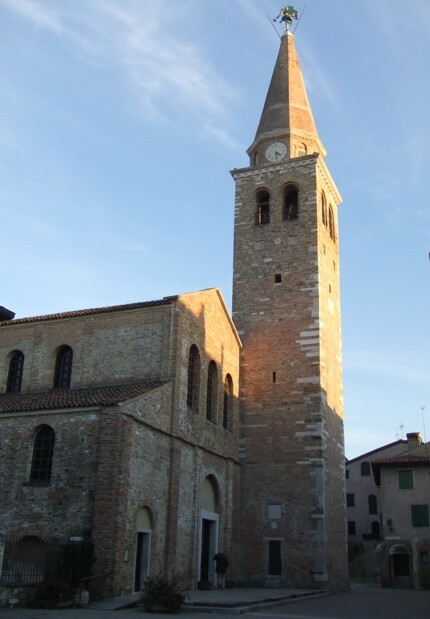 Grado's cathedral, the Duomo or Basilica di Sant'Eufemia, is the town's best tourist sight. 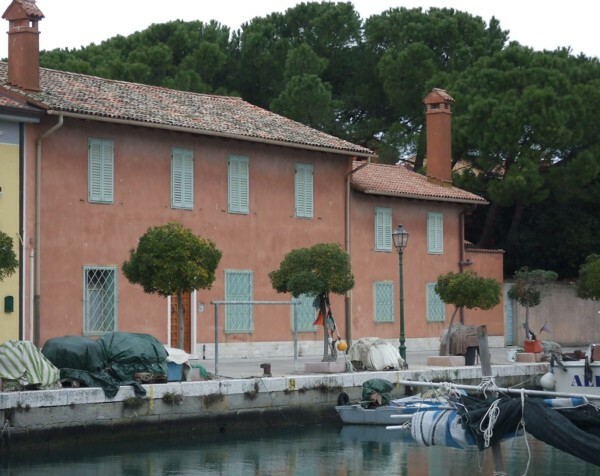 It lies in a picturesque little square called Campo dei Patriarchi which is the historic heart of Grado. The church dates to the sixth century, although it has undergone some rebuilding and restoration, and was constructed over an even earlier church. The angel on the campanile is a popular local symbol. Inside is a thoroughly impressive sixth-century mosaic, covering almost the entire floor surface. Through a glass panel in the floor it's possible to see a small patch of even older mosaic, dating back to the earlier church building. The eleventh-century pulpit is a curious and attractive feature of the simple interior. From the right-hand nave you can enter the Duomo's Lapidarium (stone collection). On the way you pass a side-room or chapel containing yet more ancient mosaic. Following signs to the Lapidario (which can also be accessed from an external door outside the church) you pass into to an outdoors area at the back of the apse, where fragments of Roman and early Christian marbles are exhibited along a covered walkway. Alongside Sant'Eufemia is the octagonal Baptistry, which dates to the fifth century. Just over the square from the Duomo is another impressive early church; the Basilica di Santa Maria delle Grazie. This dates to the fourth century and, having had some later accretions stripped away, is now a simple space exuding calm, still containing a few early sculptures. To the right of the nave is an open area where you can look down at mosaics dating to an early phase of the building. Grado is rightly proud of its centro storico (historic centre). Although it is very tiny compared with the modern town, and both sea and lagoon are invisible, this little medieval quarter is easily the most charming part of Grado. Like Venice, medieval Grado is composed of calli and campielli (lanes and courtyards). The old fishermen's houses cluster together, almost one on top of the other; all winding alleys, pretty little squares and staircases decorated with plants. It's surprisingly easy to lose your sense of direction, although the maze is only a few lanes deep. The whole area has a well-kept and friendly feel, and is peppered with tempting bars and restaurants. Most of the town's other attractions are the kind you wander past or through. 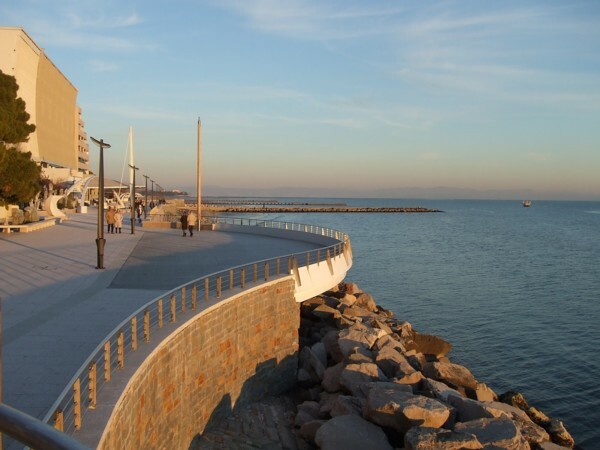 There is a lovely promenade above the seashore, which curves around the centre of town. There's no beach here; the water laps on rocks below the path. There are benches to sit and admire the views along to the head of the Adriatic (in the direction of Trieste), over the sea to Slovenia and Croatia (my mobile phone keeps receiving messages welcoming me to Croatia) and westwards towards the Veneto shore. Local old men arrive on bicycles and gather for a natter by the sea and the war memorials (one to airmen, made of a propellor retrieved from the sea). Towards the long western beaches there are smart new water features, dolphin sculptures in the sea and rows of little bars and shops. Part of the long beach-front promenade that continues to the west is enclosed in the main paying-beach complex (more below) but out of season this is open to wander. Back inland the town has several pleasant shopping streets, some in a pedestrianised area, with a few interesting shops and more places to eat and drink. In Piazza Marin (named after local poet Biagio Marin) archaeologists have uncovered ruins of another basilica, which lie in the open air. Over towards the lagoon side of Grado are the fishermen's harbour and marina. Plenty of boats are moored along the island's shore and along the Canale della Schiusa, but the serious fishing boats can be seen in the Porto Mandracchio, a harbour-canal which enters into the heart of Grado. It's a pleasant stroll out towards the lagoon along this wide canal, where the waterside is dressed with the curious juxtasposition of pretty manicured trees and rough piles of fishing nets. There's a trade fish-market along here; where the catch is unloaded from boats this side, and driven away on lorries from the other side of the building. The Isola di Barbana is the small island with a church on it that you will doubtless have seen across the lagoon. The church - a Sanctuary dedicated to the Madonna - is a popular pilgrimage destination. There is a scheduled ferry service to the island, but in the winter it only runs on Sundays (for Mass). The boat to Barbana leaves from the Canale della Schiusa, close to the road bridge over to the Isola della Schiusa. A noticeboard alongside the ticket kiosk displays departure times. Once a year, on the first Sunday in July, there is a religous festival on the lagoon when a procession of decorated boats heads across to the Isola di Barbana for a mass to celebrate Grado's relief from a thirteenth-century outbreak of plague. The event is called the Perdon de Barbana. For years there have been mentions of a new museum 'about to open' in Grado, dedicated to marine archaeology and featuring the wreckage of a Roman ship which was found here. If the museum is ever finished, it should be fascinating to visit. The centre of Grado is absolutely packed with places to eat and drink, most of them priced very reasonably. Even in winter, when many are closed, there is still a respectable choice. Many smart, atmospheric and appealing restaurants are dotted through the lanes of the centro storico. I dined at cosy little Al Balaor (just behind the Hotel alla Città di Trieste), where I ate a superb dish of gnocchi with gorgonzola and radicchio. For a faster meal or take-away, you can buy rolls and sandwiches in bars, or pick up a slice of pizza. At Pizza.it in Piazza Marinai d'Italia you can buy a cheap slice of hot pizza and eat it perched on a stool overlooking the harbour. Large numbers of gelaterie, pasticcerie and bars offer ice cream, pastries and snacks to the hungry visitor. After a wintry walk along the seafront, I strongly recommend the cakes and hot chocolate of Dolce Stil Novo on Via Zara. If you prefer to make your own meals, try visiting the covered food market on Piazza Duca d'Aosta, or pop into one of the town's bakeries for fresh bread. Grado's beaches are on the Adriatic side of the island, facing the sea with views up to the head of the Adriatic and across to the mountains of Slovenia and Croatia. 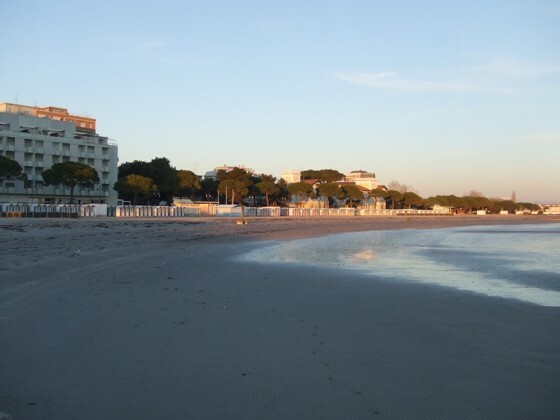 There are a couple of beaches in Grado: the main beach is wide and sandy (with some grit and shells) and stretches along the length of the modern holiday town, backed by a promenade, pine trees and hotels. There is a smaller beach, the Spiaggia Costa Azzurra, on the other side of the historic centre. If you are heading to Grado for a beach holiday, you should be prepared for the Italian beach experience. Beaches are basically divided into businesses and you will pay for everything: entrance, changing rooms, showers, sunbeds. The beach experience is a formalised one: sunbeds in rows; no throwing down a towel and digging to Australia. Beaches are well-equipped with all you need for a pleasant, safe and well-equipped day sunbathing and swimming. There are cafe-bars and children's playgrounds by the beach, so you don't need to leave all day. A long stretch of Grado's beach and adjacent facilities, making up a combined beach, spa and sports area, is run by Grado Impianti Turistici, with ticket kiosks and set prices for everything. Facilities include tennis courts and an indoors swimming pool offering spa experiences in heated seawater. You can read sample prices on their website (see links panel; you may find more up-to-date prices in the Italian-language section). There is a good range of things to do in Grado; as a holiday resort it is active and organised. Bicycles can hired from a number of places (including some hotels). Cycling is a good way to explore the more distant reaches of the island and there are cycle paths around town. Along the main beachfront area, the main complex (described above) includes tennis courts and an indoors swimming pool with long windows facing the sea. There's an 18-hole golf course by the lagoon outside town - investigate their special offers: e.g. free play on Tuesdays for women. Those feeling adventurous could try windsurfing or hire a boat; otherwise you can join a scheduled lagoon excursion. Most boat trips are only in summer months, but on winter Sundays there is still a ferry to the Isola di Barbana (timed for Mass). For less active forms of entertainment, keep an eye on posters around town for cultural events such as classical music concerts and for films at the town's cinema or on a summer outdoors screen. If you are staying in Grado you shouldn't miss the archaeological sites of Aquileia, just ten minutes away by bus. 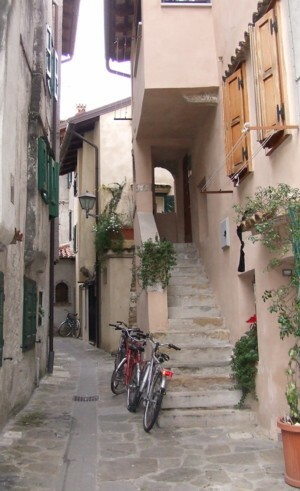 Regular SAF buses run on to Palmanova, a star-shaped fortified town planned by the Venetians. From Cervignano railway station (more below) you can catch trains to Venice (an hour and a half) or Trieste (half-an-hour) for a longer day trip. In the summer there are boat excursions around the lagoon and sometimes to more distant destinations like Trieste. It is easy to travel to Grado. Ryanair operate budget flights from the UK to Trieste Airport (also known as the Aeroporto Friuli-Venezia Giulia), which is just 11 miles from Grado. There are direct bus services, run by APT, from the airport to Grado; the journey takes an hour. Other convenient airports include Venice Marco Polo and Venice Treviso in the Veneto - from Venice or Treviso you can take the train up into Friuli-Venezia Giulia, or drive. The nearest railway station to Grado is at Cervignano and regular buses make the 25-minute journey. Cervignano station is on the regional railway line which connects Venice and Trieste, making it easy - and cheap - to reach either city. The bus station in Grado is in Piazza Carpaccio, which is very central: just a couple of streets from the harbour. Buses, which stop at Aquileia on the way to Cervignano, are run by APT and SAF: you can buy integrated tickets valid on either service from the ticket kiosk in Piazza Carpaccio. Some services run on to Udine, Palmanova and other local towns. There is also a local service within Grado, which is useful if you're travelling out to the more distant modern developments. Maps, timetables and lists of shops selling tickets are available at the bus station or tourist information office. For the bus company websites with online timetables, see our links panel on the right. Grado is bursting with hotels and holiday apartments, although out of season your choice will be restricted. Check the distance of your hotel from the town centre, since the modern part of town spreads a long way eastwards. I stayed in the very central Hotel Alla Città di Trieste.